AUTISTIC KERRY-ANNE FRITH FROM KENT RECEIVES STAR AWARD FROM HER MARTIAL ARTS GOVERNING BODY, NAKMAS. The National Association of Karate and Martial Art Schools (NAKMAS) created the prestigious NAKMAS Star Award; an award of recognition for outstanding talent and abilities within its membership, both adults and children. 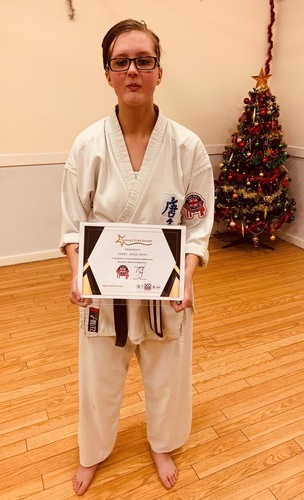 Kerry-Anne Frith, an 18-year-old with Asperger’s Syndrome from Broadstairs in Kent, has received the second of the awards for her outstanding coaching talents in karate. Kerry-Anne has been training with Joe and Sandra Ellis of the Kent Karate Schools in the Ramsgate branch from the age of 10, and she is now working towards her black belt which she hopes to achieve in 2019. She is currently at college training to be a car mechanic and qualified as a youth karate coach in February of this year. Her martial arts training has given her confidence and focus, often lacking in autistic individuals. Ellis said: ‘I’m so pleased for Kerry-Anne receiving this award; as she has reached the higher grades, and more so since her 18th birthday, she has been assisting at my classes. The children respond well to her and she has the absolute respect of other coaches and parents alike. Kerry-Anne communicates directly with confidence and clarity. She is a great role model to our other members as she is a fine and genuine martial artist’. Members of all ages and all martial arts are considered for nomination of the NAKMAS Star Award for areas within martial arts including coaching, innovation, dedication, competitive talents, and charity work etc. Each nomination will be judged with principles of fairness and equanimity enabling the awards to be spread out over a wide range of activities for a wide range of recipients. NAKMAS National Deputy Chair, Gary Smith, said: ‘NAKMAS has seen individuals throughout its 27 years, showing real talent and abilities. We created this award to highlight individuals that NAKMAS feels should be recognised nationally, and with our full support. We have been hearing about Kerry-Anne’s talents and have pleasure in rewarding her’. The award includes a specially designed gold foiled Star Award certificate, highlighting the recipient on the Star Award website (www.staraward.nakmas.org.uk) and a personal letter and press release from the NAKMAS Chair, which can be used locally. NAKMAS will also allocate some funding to promote the recipients and their clubs via social media. Members will be able to make nominations via the Star Award website, and details will be found on the Members Area of the NAKMAS website. The National Association of Karate and Martial Art Schools (NAKMAS) National Governing Body is a non-funded national governing body and is a member of Sport & Recreation Alliance (formerly known as the CCPR). With its Head Office based in Kent, NAKMAS governs all forms of traditional and modern martial arts and has over 65,000 members. NAKMAS is an approved insurance provider by XL Catlin and holds a National and International Quality Standard Certificate, BS EN ISO 9001:2015, via the BSI (British Standards Institution). This press release was distributed by ResponseSource Press Release Wire on behalf of NAKMAS in the following categories: Children & Teenagers, Leisure & Hobbies, Sport, Education & Human Resources, for more information visit https://pressreleasewire.responsesource.com/about.